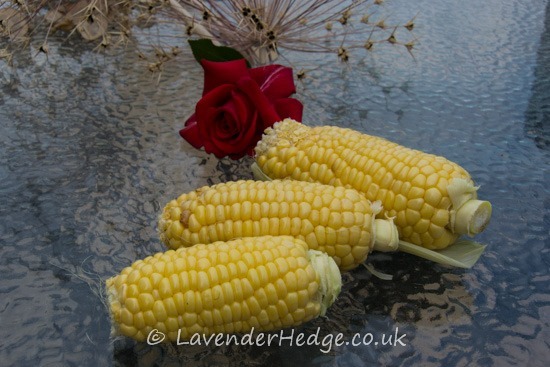 You can’t beat home-grown sweet corn – these went from the plant to the pot in minutes! They were absolutely delicious and so much sweeter than any you will find in the supermarket. The Autumn equinox seems to be an appropriate time to review what’s worked this year in the kitchen garden and what we have still to look forward to. 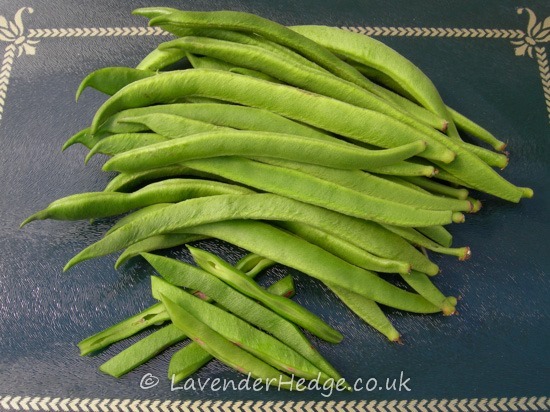 The runner beans have been a real disappointment this year. The cold spring, a bad attack of black fly and the hot dry summer have not suited them at all. Ladybirds were a rare sight this year and the black fly thrived, despite the plants being surrounded by calendula and French marigold flowers which are supposed to repel them. Interestingly though the climbing beans were unaffected by the black fly. The runner bean and French climbing bean plants have been taken down and the canes put away for another year. 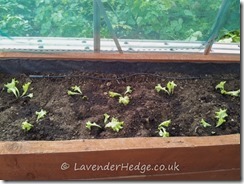 I have left the root balls in the ground so the nitrogen they contain can seep back into the soil. I’ve noticed that the cost of vegetable seeds has risen quite a lot in recent years, due to the popularity of growing your own. 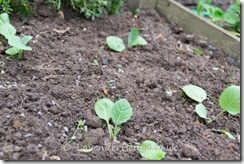 It’s worth trying to keep some seed if you can and runner bean seeds are one of the easiest to save. 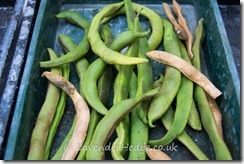 Just choose some of the beans that have large seeds in, dry the pods out and remove the seeds. 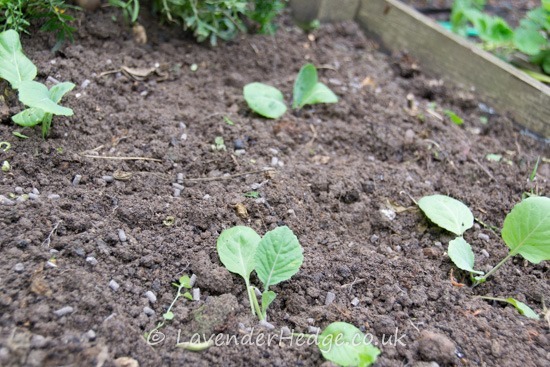 Keep in a cool, dry place and they will germinate well next year. 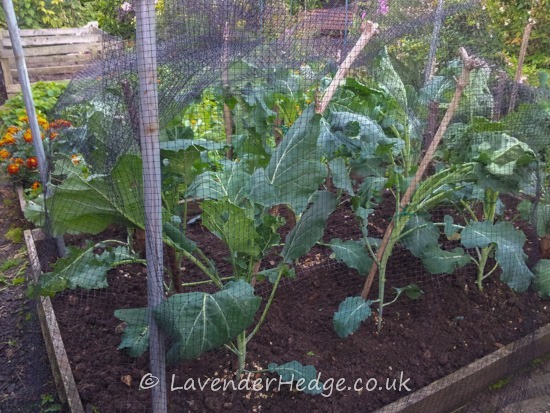 The purple sprouting is growing well, although the cabbage white butterflies had managed to get through the netting to lay their eggs. I found lots of small caterpillars busy chomping their way through the leaves! 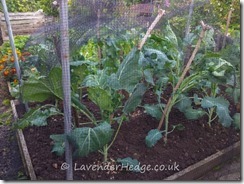 So, caterpillars have been removed, plants staked to stop the wind rock and the netting has been replaced. We now look forward to picking it next spring. It has been a good year for potatoes and we are still eating our way through the harvest. The Charlottes are still being cooked with their skins on and taste so good. We’ve had a couple of pickings off the sweetcorn, but these were probably a bit on the small size due to lack of rain, but still very sweet. Durham Early cabbages have been planted out for an early spring crop, well protected from the numerous pigeons that frequent the neighbourhood! We replanted the strawberry bed this spring, so didn’t expect many strawberries. We did get a reasonable crop though. The plants are looking so healthy now and looking forward to next summer! We are still picking autumn raspberries and these will continue for a few more weeks. Have frozen a load for the Christmas trifle. The old canes on the summer raspberries have been cut out and the new ones tied in. In the greenhouse, it has been a good year for tomatoes and I even managed to get a good crop of cucumbers this year. The shading worked well and seemed to have got the watering about right. Since the tomatoes had more or less finished, I picked the remaining ones and removed the plants. The green tomatoes are in the fruit bowl next to the bananas and are slowly ripening. 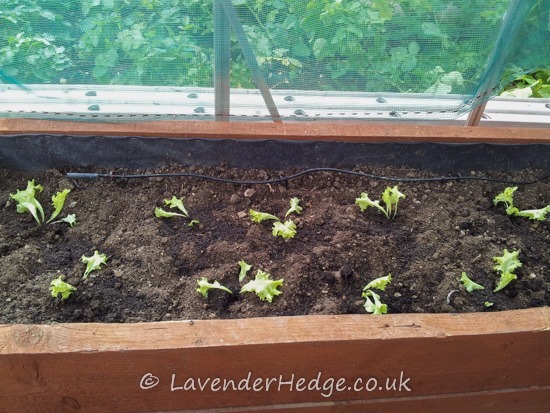 In their place I have put in some lettuce plants, which hopefully will be mature before the first frosts. When it begins to get a bit colder I will attach bubble wrap to the inside of the greenhouse, which will help protect them. I hope your allotments and vegetable gardens have provided you with lots of yummy fruit and veg. Don’t give up if you have had disappointments, that’s gardening for you and there is always next year to look forward to! Keep a close eye on developing sweetcorn. Once the silk tassels have turn brown, they should be ready for harvesting in about a week, depending on the weather. 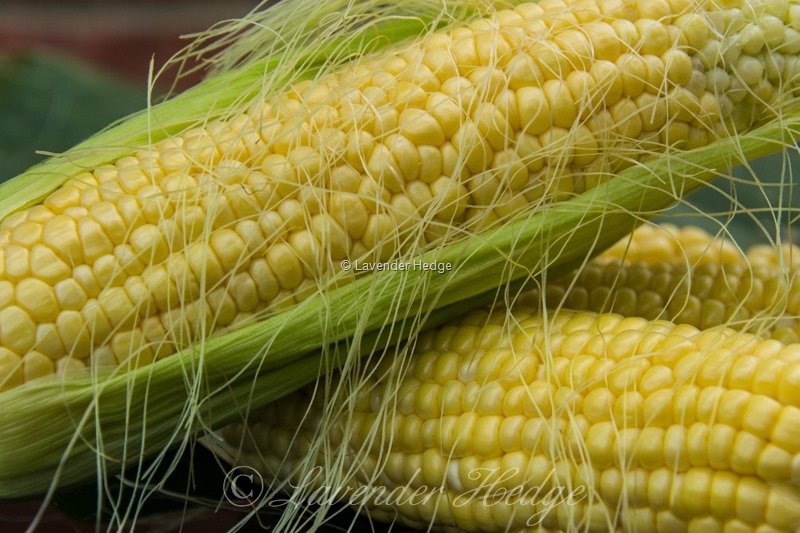 To check the sweetcorn is ripe you need to peel back the outer layers of husks to reveal the kernels. Sometimes the kernels near the top of the ear of sweetcorn may not have developed, so it’s always worth checking further down the cob. Sometimes the ears of corn don’t get properly fertilised so not all of the kernels develop. 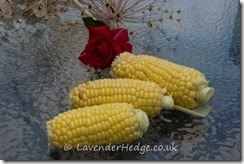 The rest of the sweetcorn is still edible, just cut off the under developed part of the cob. Use your thumbnail to puncture a kernel. If the liquid is translucent and milky then the sweetcorn is ready for harvesting. If it is still watery and clear then they are not yet ready and you need to replace the husks. 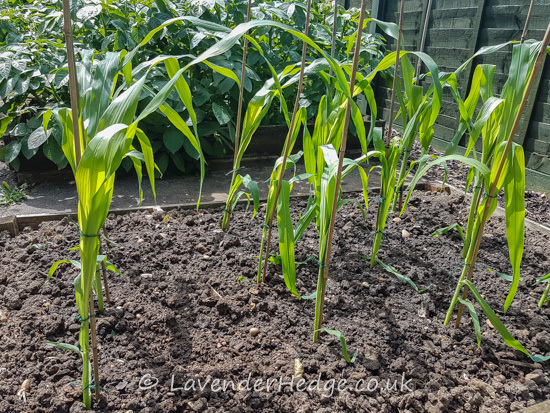 The first year I grow sweetcorn, I kept leaving the cobs thinking they weren’t ready. In fact it was just that the top kernels that had not developed properly. We ended up with over-ripe cobs which were rather dry! Pick the cobs as close to when you are going to cook them as possible. Once picked, the sugar in the kernels turn rapidly to starch. They can easily go past their best in a day or two. 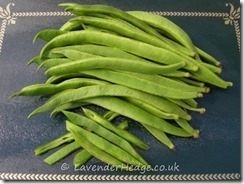 This is the reason why it is worth growing your own, as shop ones just don’t taste as sweet! Picked our first sweetcorn cobs of the season for our tea today. They were delicious. Sweet and juicy!